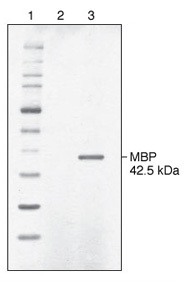 Expression of proteins in yeast is a common alternative to prokaryotic and higher eukaryotic expression. Yeast cells offer many of the advantages of producing proteins in microbes (growth speed, easy genetic manipulation, low cost media) while offering some of the attributes of higher eukaryotic systems (post translational modifications, secretory expression). Several yeast protein expression systems exist in organisms from the genera Saccharomyces, Pichia, Kluyveromyces, Hansenula and Yarrowia. At the heart of any yeast expression system is the expression vector. Vectors that integrate into the host chromosome are most widely used because of their mitotic stability in the absence of a selection. However, episomal expression vectors exist for some yeast systems. Expression vectors typically contain a strong yeast promoter/terminator and a yeast selectable marker cassette. Most yeast vectors can be propagated and amplified in E. coli to facilitate cloning and as such, also contain an E. coli replication origin and ampicillin selectable marker. Finally, many yeast expression vectors include the ability to optionally clone a gene downstream of an efficient secretion leader (usually that of mating factor) that efficiently directs a heterologous protein to become secreted from the cell. A growing number of engineered yeast strains are becoming available for protein expression. Strains have been described that increase yield of secreted proteins, improve the performance of certain affinity tags, reduce proteolysis, define the composition of N-glycans, and permit non-native amino acids (e.g. selenomethionine) into proteins have been described. One yeast system that is commonly used for protein expression is Kluyveromyces lactis. K. lactis was one of the first yeasts to be used as an expression host in the early 1980’s. It was developed for use in the food industry and was harnessed for industrial production of bovine prochymosin, an important cheese manufacturing enzyme. In addition, K. lactis and S. cerevisiae are the only two yeasts classified by the NIH as Host-Vector I systems, an important biosafety designation, making it an attractive host for use in regulated industries. The system was adapted for life sciences research by NEB and a variety of vectors and host strains in a frozen competent format suitable are offered. 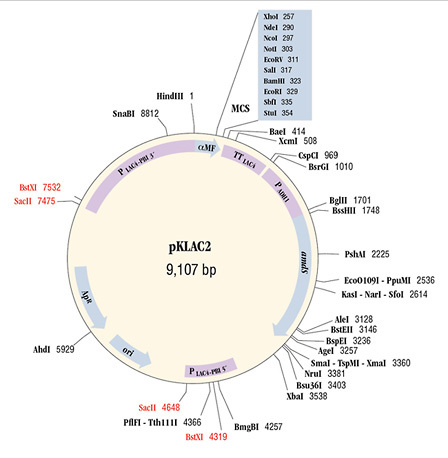 pKLAC2 (9107 bp) contains the 5´ and 3′ ends of the LAC4 promoter (PLAC4-PBI) separated by DNA encoding β-lactamase (ApR) and the pMB1 origin (ori) to allow for its propagation in E. coli. 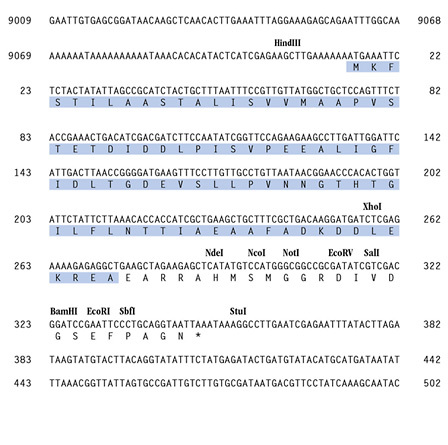 The K. lactis α-mating factor secretion leader sequence (α-MF), multiple cloning site (MCS), and the LAC4 transcription terminator (TT) lie immediately downstream of 3´ PLAC4-PBI. The yeast ADH1 promoter (PADH1) drives expression of an acetamidase selectable marker gene (amdS). The vector can be linearized by digestion with SacII or BstXI to create a linear DNA fragment capable of inserting into the native LAC4 promoter region of the K. lactis genome.